Mondo Lifestyle Resort is a unique surf resort nestled between the beach and the rice fields of Canggu. Neighbor to one of Bali’s best surf spots, our guests are just a few minutes away from the beach yet still enjoy the calmness of the Bali life. Our resort sits on a 3,300 square meters plot of beautifully landscaped land and also blends luxurious local architecture with an international touch in decor and facilities offered so everyone will know they are in Bali as soon as they enter the gates of our place yet they will not miss the comfort of their standard of living. Mondo Lifestyle Resort offers comfortable rooms and luxurious bedding, spacious bathrooms, TV and DVD, mini fridge, AC as well as a safe deposit box. The common areas are spacious and surrounded by nature. You will want to swim in the oversize pool all day long and laze around the hammocks. 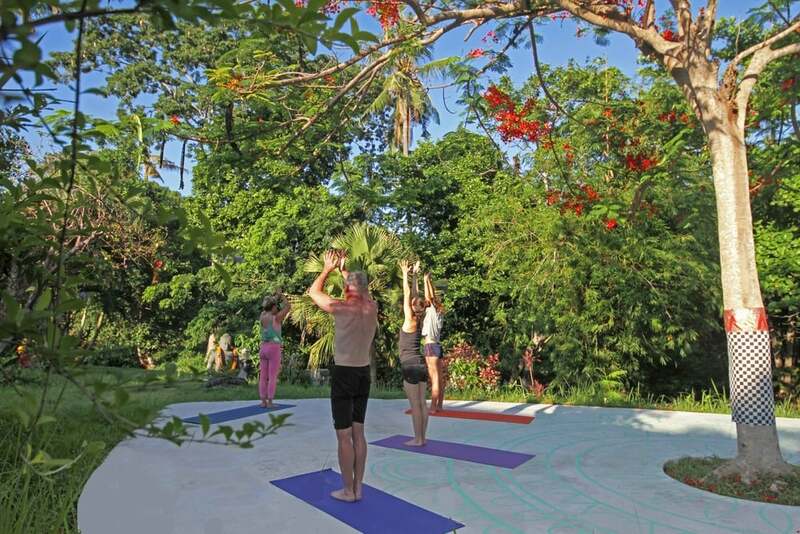 Mondo has other facilities such as a pool bar, massage bale bengong, yoga plus activities floor and an eating area. This room has 2 bunk beds and sleeps 4 persons. Perfect for the lower budget crowd. It is big, super comfortable and sheets and linen are comfortable and clean. The bathroom is open to the outside so you fell you are in the tropics and there is always a breeze passing through. Individual safety storage area is available, TV and DVD player set for the relaxing times. There is a mini fridge inside the room for personal usage. Decoration with surf photography to inspire future adventures. The Batur room sleeps 2 persons in one bunk bed. Equipped with TV, DVD and a mini fridge, this room is perfect to share with someone but still keeping some privacy. There is a comfy ensuite toilet and shower with comfortable and clean towels. The room faces our beautiful garden with a glimpse to the pool. Our bedding and linen are changed regularly keeping high standards of hospitality for a budget price. Individual safety storage area is also available. In a beautiful traditional Balinese building, this room has at its entrance a lovely balcony facing the bar and pool. A caribbean hammock sits right in front for the lay times. The room consists on queen bed and a single bed, sleeps 3 persons. Nicely decorated, with a traditional touch and european comfort standards, makes you feel you are in Bali while enjoying first class accommodation. The open bathroom concept makes you feel in the tropics overtime you have a shower looking at the outside tropical greens. A safety box and mini fridge are available as well as a AC and TV/DVD. Nice private bungalow with one Queen bed and two Single beds. Perfect for families or bigger groups of friends that look for some extra comfort and privacy. The bungalow has its own private balcony with seats and a caribbean hammock overlooking the garden and pool. The decoration is impeccable and the toilet has a bathtub and shower. Clean towels, linen and comfortable beds are waiting for great nights of rest after all the day activities. The room has AC, mini fridge, safety box and TV/DVD. This private wood bungalow is Mondo’s most exquisite accommodation. Feel the wood warmth and relax on a 2-deck private balcony overlooking the small river and tall trees that surround our resort. This is the tropical place everyone is talking about. With a Queen bed and Single it sleeps maximum 3 persons. The room is equipped with AC, safety box, TV/DVD, mini fridge and private toilet. The towels are cozy, beds are comfortable and the linen is fresh. Find the package that suits you!.. CANT CHOOSE? - The Lifestyle package includes a little bit of everything..
Daily local knowledge tips for the best surf spots according to tide, swell and wind. LIFESTYLE PACKAGE - A LITTLE BIT OF EVERYTHING! Exercise, good food and fun times. This is our “secret” recipe for a healthy lifestyle. Being in Bali we cannot ignore the modern take on food and healthy lifestyle so many people look for and take on their lives. At Mondo this means leading a happy, fun, relaxed, surrounded by people type of experience. We have this engraved in our culture so there is always something new and fun happening. Experience Mondo. Experience Healthy Lifestyle.